Allercalm Shampoo is specially formulated to clean and soothe sensitive skin. Allercalm Shampoo supports the skin's natural defences, balances the skin's natural oils and moisturises. Soap-free shampoo with oat extract in encapsulated (spherulites) and free forms. Also contains chitosanide. Allercalm is specially formulated to clean and soothe sensitive skin. The shampoo supports the skin's natural defences, balancing its natural oils and moisturising. Oatmeal has calming, beneficial properties for red, sensitive skin. Spherulites are multi-layered, microscopic spheres which provide a slow and prolonged release of active molecules. Chitosanide is a biodegradable biopolymer that helps the spherulites attach to the skin and hair, and also has a moisturising effect. 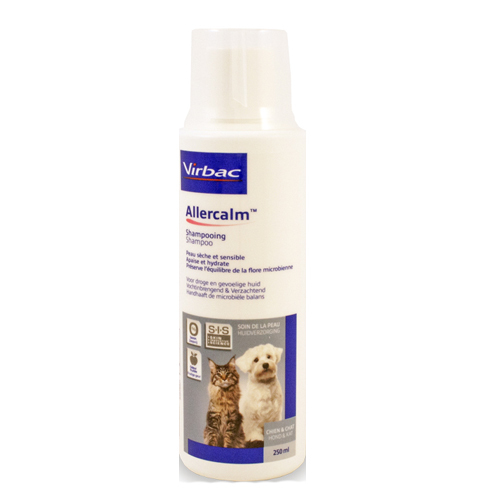 Virbac Allercalm is an itch-relieving shampoo, for the prevention or treatment of sensitive skin. It is also suitable as a maintenance shampoo or for regular washing of animals with normal skin. Shake well before use. Use lukewarm water and soak the fur. Massage the shampoo into the wet coat and onto the skin, rinse and repeat the treatment. Let the shampoo soak in for 5-10 minutes and rinse well. If necessary, blow dry the fur. Allercalm can be used daily. Avoid contact with eyes and mucous membranes. Should contact occur, rinse well with water. Have you used Allercalm SIS Shampoo before? Let us know what you think about this product.